When night begins to fall on the sleepy town of Woodinvale, the shadows and fog rolling in bring with them more than just a chill shiver. A living nightmare erupts as the once peaceful community is overrun with the restless dead – scratching and clawing their way to the surface with an insatiable hunger for human flesh. Now only a handful of unlikely Heroes are left, banding together to fight for their very lives. On a night that never ends, the only thing worse than death is becoming infected. Felicia Day, Riki Lindhome, and Kate Micucci Join Wil to play Last Night on Earth! There are a number of games that include zombies in them, whether as an aside or as the main focus of the game. Zombies are almost commonplace now, even crossing genres of games. But when it comes to zombie themes, sometimes you just have to go back to the place where it all began: the B-Movie genre. Last Night on Earth is a game that takes the tried and true formula of survival horror and gives it a fresh new look, offering general play along with quite a few scenarios to play with specific goals in mind. Players of the game can play as the Heroes, a group of humans trying to survive the night, and a player can also take on the role of the Zombies, the hordes of undead that hunger for human flesh. Every turn, the zombies spawn more of their number, and it is up to the humans to survive the night…or die trying. Last Night surpasses most of the other zombie survival games that are out on the market in terms of feel and style. This game is absolutely GORGEOUS. The board itself is a simple layout that is utilitarian and does is job in setting the field, but the Hero Characters and the various set of cards are presented in such a way that you really get a feel for the theme that the game is trying to represent. The items and characters that you see in the cards are taken from scenes that look like they might have been taken from an actual zombie movie, and even the cards themselves are titled in the style of the game and provided with flavor text that just screams B-movie. The game as played with the base scenario plays fairly simply; the hero players need to kill 15 zombies in 15 turns, and the zombie player needs to stop the heroes from completing their objective, or take out two of the heroes. The heroes have special abilities that vary from character to character; some characters can heal their wounds with time, while others start out with weapons, or have special talents. The zombies themselves have no weapons, but the player controlling the zombies can give them special advantages through the use of Zombie Cards. Zombie Cards can provide a variety of effects, such as closing off a building, making a location dark and hard to see, or even prompting a character to be forced into a compromising action. Some Zombie Cards can even give the zombies a chance to turn a hero into a Zombie Hero, a more powerful variant of zombie that is tougher to take down than most. The heroes have their own deck, however, the Hero deck, which can help stem the tide of misfortune, as well as providing some useful items to be used in a pinch. Combat is also simple, but the edge is largely on the side of the zombies to start. In the most basic sense, Heroes get two dice to roll in combat (though more can be added with items or abilities), and zombies get one (again, more can be added). The zombie has to beat or tie both dice with its roll in order to deal one wound to the hero. With enough wounds, that hero will die. If the hero instead beats the zombie with their die roll, the zombie is fended off, but doesn’t take any damage. To actually kill or wound a zombie, doubles have to be rolled (and the Hero still has to win the fight). This can be real trouble for the hero if he or she gets surrounded and has to fight multiple zombies and has no way to clear them out. Weapons make the task of fighting zombies a lot easier, mostly by eliminating the need for doubles to kill a zombie or by allowing extra dice to make rolling doubles easier. In true horror movie fashion, however, weapons can sometimes break, or run out of ammo. One bad die roll can turn the advantage back to the zombies’ favor just like that. This game offers a lot to both sides (humans and zombies) to enjoy playing; Hero players will enjoy the fight for survival and looking for those key items that will give them a better chance to survive, and the zombie players will enjoy the savageness of the zombie horde trying to single out the heroes and take them down, as well as the many movie cliches that are apparent in the cards. Besides this game being fun to play, Flying Frog Productions did a fantastic job in their production value, and I believe that this game is worth getting for the card art alone. I’ll start this review with the statement that I’m not a huge fan of zombie movies. I’ve seen my fair share of them, so I’m familiar with a lot of the cliches that go along with them. I don’t hate zombie movies, but I don’t seek them out to watch them. Having said that, I love Last Night on Earth: the Zombie Game. This game makes you feel like you’re living out a classic zombie movie, and, in my opinion, that is way more fun than watching one. The first thing ot talk about is the theme because this game just oozes theme (along with various other disgusting and unidentifiable bodily fluids :)). The components, artwork, and gameplay all combine to produce the sensation of a frantic, losing struggle against a slow, overwhelming mass of enemies. The quotes on the cards and the situations the hero players find themselves in could have been pulled from any number of late-night B-movies, and it’s all done with the same kind of tongue-in-cheek feel. There are lots of opportunities to laugh and groan in equal measure. As an example, in a recent game, we witnessed the following events unfold: the troubled teen, in a fit of angst, bickered with his father, the sheriff, forcing them to lose a turn; that same sheriff later sacrificed himself to save his son; the high school sweetheart and the jock happened to be alone in a building and thought, “you know, this could be our last night on earth…,” and they lost a turn (just like in the movies! ); that same jock was later trying to sprint away from zombies, only to be tripped and surrounded (he subsequently destroyed three zombies with his baseball bat and survived). The game really makes you feel like you’re immersed in a cheesy movie. The components of the game are also great. It comes with 14 miniature zombies (in two colors, in case you end up with two players on the zombie team), 8 hero miniatures, hero and zombie card decks, a variable game board, multiple thick cardboard scenarios and hero cards, a ton of small dice, and various other cardboard counters and markers. Oh, and it comes with a soundtrack as well (more on that later). The miniatures are nicely sculpted, and while I at first thought it would be better with more zombies, the game is hard enough for the heroes to win, so having a limit to the number of zombies on the board does even the odds somewhat. The hero minis are also great, but it did take a little work to identify who was who. The gameboard is well done with a double-sided center piece that serves as the town square in some scenarios and as the manor house in others. Attached to the center square are randomly-chosen L-shaped pieces that include various locales. These are well-done and offer all the small-town places that zombie movies love to have, including a church (and graveyard), farmhouse (with cornfield), school (with gymnasium), and gunshop (with guns!). The scenario and hero cards are over-sized, thick cardboard pieces that look great and offer room for counters and card effects. And the best (or worst, if you don’t like cheesy zombie movies) part is that the various hero and zombie cards all depict scenes from a fictional zombie movie with live actors and over-the-top make-up and gruesome effects. These cards also include various quotes from the movie, as well (like, “Stand back! I’ll hold them off!”, and, “Urghhh!”). As I mentioned earlier, to complete the zombie movie feel, a soundtrack is included, but, while a nice touch, it doesn’t necessarily add to the game. The gameplay is very straightforward and easy to pick up, making this very accessible to casual gamers. Depending on the number of players, one or two people play the zombies, and the rest take the role of four hero characters. These characters are all the usual zombie movie tropes, including a troubled sheriff, his angst-ridden son, a farm girl, a preacher, a nurse, the high school quarterback, and several others. Each round is made up of a zombie turn, followed by a hero turn. In the zombie turn, the zombie player moves the sun track marker, which acts a timer in the game (when the sun goes down, zombies overrun the town, and the game is lost), draws more cards, moves all zombies and fights with any that are able, and then adds any newly-spawned zombies. On the hero turn, each hero character has the option to either move (based on a D6 roll) or search (if he or she is in a building). They can then exchange items if they share a space with another hero, make one ranged attack if they have a gun, and fight any zombies in their space. Fights are based on rolling dice. The humans roll two and keep the highest; zombies roll one but win on ties, and the humans only kill the zombie if they roll doubles. What adds to the fun and drama of the fights is that the zombie and human player have the option to play various cards and items that help to modify dice rolls, add additional dice, or potentially cancel the other player’s cards. Also, depending on the weapon, certain rolls will result in the weapon breaking or the gun running out of ammo (doesn’t that always happen in zombie movies?). In each game, the players run through a scenario, which determines the winning conditions for the heroes. There are five scenarios with the base game, and they vary from killing a certain number of zombies to gassing up the truck and escaping to saving the townsfolk. The scenarios vary in difficulty, and the same scenarios play out differently, depending on the special abilities of the hero characters in the game and the makeup of the gameboard. Flying Frog also has several downloadable scenarios available, as well as some included in various game expansions. This makes for a great deal of replayability. In terms of negatives, the game definitely has some themes that may be inappropriate for younger audiences (just like a zombie movie). I actually take out the “last night on earth” card when playing when my son, but he thinks the zombie cards and pictures are great. Also, the rules may seem a little clunky to game purists (I think they work quite well, but I can understand that others may disagree). The game may also be a little too light for some gamers. The fun really comes with the player interactions and the general zaniness associated with hordes of flesh-eating monsters trying to devour innocent townsfolk. And if you don’t like zombie stuff, you probably won’t like this game. Overall, I think this is a great game. It is really simple to teach and to learn. In fact, in some ways, this could be considered almost a party game because it is so accessible and fun. It has some great mechanics and fantastic theme, and it does an amazing job of producing an engaging narrative that will have you reliving game moments long after you finish playing. If you’re okay with zombies and some occasional off-color and over-the-top humor, this game is definitely one to get. If you’re a fan of games oozing theme, especially zombie games, Last Night on Earth is a “must try” for you. Fans of games where the fun is more in the experience, and less in strategizing, will likely enjoy this game. As a more strategic Euro-gamer myself, I can assure you there is fun to be had in this game, even if theme is not a major selling point for you. The game attempts to place the players inside a zombie movie. If your group is willing to embrace the theme, this goal is easily met. Last Night on Earth pits one zombie player (two if six are playing) against the heroes, who work cooperatively to achieve a goal, which depends on the scenario you’re playing. The game includes a modular board setup, allowing for variety in play. Players will have to cooperate in order to win. I’m a fan of the game allowing the players to choose which order they take their turns. It’s a bit of freedom, not being locked into a turn order, that is not present in many co-ops such as Pandemic, Shadows Over Camelot, or Defenders of the Realm. On the other side, the zombies are aiming to kill the heroes, and keep them from their victory conditions. They also have cards which help them determine how best to deal with the human scourge. As one expects with zombies, if they get close to the humans, their only option it to attack, even if it means climbing through windows, or up through the floor to get to their prey. I’m not certain how well balanced the scenarios are, with them often seeming skewed in favor of the zombies. That said, there are many helpful options in the hero card deck that will aid clever heroes to victory. The game is often difficult for the hero players, without being impossible. Teamwork goes a long way in this game, as you may expect from the theme. The game feels a little rules-dense to me, for what it is. I like the attention to detail, but it makes the game a little difficult for novice games to grasp. It is not a hard game to learn, instead there are a lot of little rules that can overwhelm players. It’s a game that is probably better taught by playing through the rounds, instead of trying to teach all of the rules at once. The general turn sequence is straightforward. By the end of the first game, players will have picked up the important rules. In my experience, people do not remember games of Last Night on Earth based on whether they won or not. Instead, people are much more likely to bring up that time the sheriff couldn’t shoot anything, or Johnny saved the priest by single handedly clearing out a hoard of zombies. Last Night on Earth is mostly about the experience. If you enjoy embracing the B-movie atmosphere: run, don’t shamble, to get your brain seeking claws on Last Night on Earth. I love playing this game with my daughter, and I think the wife will enjoy it too. Not only does it place you into highly thematic “Scenes” from a generic zombie B-movie, but it also allows for co-operative play WITH “one vs. one” or “one vs many”, depending on the number of players. Another bonus, is that this game could also easily be played solo, as long as you aren’t the type to “Cheat” by not taking optimal movements or card use. I enjoy it solo as well as Vs. with my daughter (who loves playing the zombies!). We purchased this game after my daughter spent a lot of her allowance picking up ZOMBIES!!! and a few expansions. Now, while I don’t think Zombies!! is a terrible game, I find it too fiddly and a bit unfocused at times. The card tiles slide easily, the chits are difficult to pick up off of those easily slid tiles, and although it’s cool to see all of the zombies out on the board, it’s not as practical in use. So we had been looking at getting “Last Night on Earth” as a substitute for that game, and something that would also offer more variations in gameplay. Needless to say, we weren’t disappointed. I bought Last Night on Earth for my daughter for her birthday (Along with a few other games), and we were both immediately impressed. These are some of the best components I’ve seen to date. Nice, thick, shiny character boards. Same goes for the scenario boards (I hate to call them cards, because they are THICK!). You get 14 different zombies, 2 colors and 2 different sculpts. A wealth of heavy stock cards, with shiny gloss. Only negative, were a few seemed to be “stuck” kind of, after first unpacking them. But they weren’t truly stuck together, and pulled apart with almost no effort (and no damage). Two dice were, however, stuck together due to paint (apparently). I had to pry them apart, and scrub the paint off the face. Afterwards, they were perfectly functional and almost couldn’t tell they had been stuck together like that (a lot of black paint though had stuck them together somehow). The hero miniatures are very detailed, and each one is unique. A few cardboard chits for markers of different objects and townsfolk were also high quality. The included CD wasn’t great, but it wasn’t all that bad either. I can’t say I’d be driven to play it during sessions, but it’s nice they even think to include something like that! I honestly expected this game to be a bit harder to teach my daughter, but she picked it all up fast. Zombies get 1 fight die (normally), heroes get 2 by default. Cards and abilities can modify these (for instance, my daughter had a card that added 2 fight dice to her zombie’s fight roll, which helped her take a bite out of the preacher she attacked!). Zombies seemed to mostly all spawn at the start, due to her having a nice roll on her first two turns. By the end of her third zombie turn, she had all but one of the zombies on the board. My sheriff and preacher were surrounded, trying to “run and gun”, but my daughter played cards that allowed her to roll dice for zombie movement, and was able to catch back up to me each time! This made for a pretty intense time, and very fun! I barely had time to run into a few buildings and search, and although I had two revolvers unlucky rolls of “1” two out of four times caused me to lose both of them (out of ammo)! What I like the most about the game, is the different scenarios and objectives that can be played. For a standard game, you can play “Die, Zombies, Die!” and just have a free-for-all of Zombies vs Heroes. My daughter loves this mode, as do I. It’s fun, quick, and less structured. However, it is also a lot of fun to be scrambling around trying to find gasoline and keys to a truck, or trying to defend a manor/house from the approaching horde! The possibilities are great, and varied. There are a ton of hero and zombie cards, including seperate decks (20 each) of advanced cards for each. We figured, at first, that it would be much like Zombies!!! with heroes moving by dice rolls, and zombies moving only 1 space each. But the “Shamble” cards came out quick and plentiful for my daughter during our last session, and she was lunging at my heroes right and left, making it not so safe/sure to stay within, say, 3 space range to use a firearm. I learned that the hard way…lol. Trading between heroes is a nice touch as well. The preacher got a revolver, but oculdn’t use it. He was close to the police station/sheriff, though, and was running from a horde, so I moved him close to the sheriff and once on the same spot they could trade. The nurse can heal a wound on a survivor that she shares a space with. Every character has a unique ability, and it makes the game quite interesting and adds another layer of strategy and planning, while not overly bogging things down. THIS GAME IS JUST FUN. I love zombies. My daughter is taking after me apparently, and although she loves ponies and princesses, she also loves dragons, monsters, and ZOMBIES! My best times gaming, so far, have been while playing this game with her, and I am very glad for the purchase. I almost gave this game a perfect score, but because of the dice stuck together, and I’m not sure how to rate the aspect of NEEDING expansions (not that they are a REQUIREMENT, but they all appeal in one way or another, so I’m sure I’ll be shelling out more money). Since Timber Peak and Survival of the Fittest both appeal greatly to me, I’m sure I will be dropping more money on this game, and if those elevate the game to even greater levels then I will rate those expansions accordingly. I have to admit, though, for zombie lovers this game is a 9/10 easily, and that is what I intended to rate it (But accidentally clicked the 8 instead, seriously BG.com, let us change our ratings!). If you aren’t much into zombies, and are looking for a mathematically deep euro-style experience, stay away. There is planning and stragegy here, but it can be unravelled by a bad roll (or at the least, impeded). Some games can seem to be in the zombie’s favor, but other times it seems to balance out perfectly. Last Night on Earth is one of those games that every game library should have. With a ride range of players, absolutely wonderful components, easy-to-learn rules, and a good amount of replay value, Last Night on Earth is, in my opinion, one of the top 3 zombie themed games available on the market! A zombie-survival horror game, Last Night on Earth is set in a small town, with a dark past. A dark past which some are aware of, but have tried to keep secret since the last, fateful incident. On this day, however, a sleepy little town will be haunted by the nightmarish creatures known as the walking dead. And as one of four heroes, it’s your job to kill zombies, save the townsfolk, defend your home, destroy the spawning pits,or simply escape in one of five different scenarios! Or, as a zombie player, your job is to stop the heroes at any cost! Last Night on Earth provides the players with a choice of 5 different survival scenarios, each with different objectives and gameplay. And with 8 different heroes to choose from, each with their own separate abilities, this adds up to quite a bit of replayability. The components are high quality, glossy, and sturdy. Each survivor has their own, individual sculpt, and zombies come in 3 different sculpts. LTON actually uses real actors to portray heroes and zombies on game cards, which is a unique approach from the norm of digital or hand-drawn art, and certainly makes this game stand out. The rulebook is easy to understand, and navigates relatively well, also providing a small amount of fluff. New players should be able to pick up the rules with relative ease, understanding things quite well after a game or two. Now, this in mind, hero players should not expect to win their very first game, especially if most are new players. To succeed, this game does require a good amount of teamwork. But that doesn’t mean it isn’t fun; on the contrary, this game is quite thematic, and has some intense moments! Event cards will trigger unexpected occurrences (such as a building being overrun by zombies, power outages, rainstorms, and new spawning pits), which adds combat factors and can throw unexpected wrenches in the survivors strategy! Holding out in a barn-house and picking off zombies works great, until the undead begin to emerge from the floor, or a particularly quick zombie leaps inside and causes the heroes to take an unexpected wound! These moments help to break up slower gameplay, add theme, and help to assure that heroes can’t just camp or stick with a single plan; they’ll be forced to think quick and remain flexible. Overall, you shouldn’t be disappointed with this game! Great packaging, sturdy components, eye appeal and thematic, easy and fun system. No options or scenarios are included for shorter games. LNOE is a great Us vs. Them team game. Depending on the number of players, you always have one team playing the zombies and one team playing the survivors. This makes for a nice balance when you have differing numbers of people in your group. The survivor player(s) have several characters to choose from – all based on any cliche you can expect from a typical zombie movie. In fact, the game design/production has a strong b-movie flavor (more on that later). Each survivor has their own special ability and sometimes equipment. This adds to the replayability factor. The zombie player(s) just have several zombies. What they lack in skill, they make up for in quantity. The game comes with several boards that can be pieced together. There is one main board (with two sides) and several L-shaped minor boards (each with two sides) that wrap around the main board. This greatly adds to the variety of the game. On top of that, there are several scenarios to choose from (or take randomly). And that’s just with the main box. If you add in the expansions (which I have not seen or played), then you truly have a ton of options here for maximum flavor. I mentioned the B-movie flavor earlier. Depending on your personality, this can really enhance or detract from the game. Personally, I figure that if I’m playing a game where I get to shoot a shotgun at zombies, then it’s all fun anyway. The production quality of the game is decent, but not the greatest. Everything is very glossy – in fact, this seemed to make the cards (which are thicker than normal) somewhat sticky. It took a lot of shuffling to make them playable, and even still I sometimes toy with the idea of tossing some cornstarch on them to smooth them out a bit. On the plus side, you could probably wipe them with a damp rag if they were to get some food on them. The character photos (and those in the rulebook) are actual actors. Some people I know hate this, others love it, so your mileage may vary. Gameplay appears to be balanced. I figure that any game where both sides complain that the other has the advantage means that it’s actually where it’s supposed to be. The players can coordinate (zombies always have to go towards a player if one is nearby), they can get and use items, they have skills, and zombies are somewhat easy to kill. The zombies have the advantage of time (there’s only so many turns in the game), they have the numbers (and keep respawning), and there’s the especially nasty Zombie Deck with which to surprise an unsuspecting meal…er, survivor. I enjoy this game, think it has great replayability, and is ideal for someone who gets a gleam in their eye when they realize that they have the gas can AND the lighter. 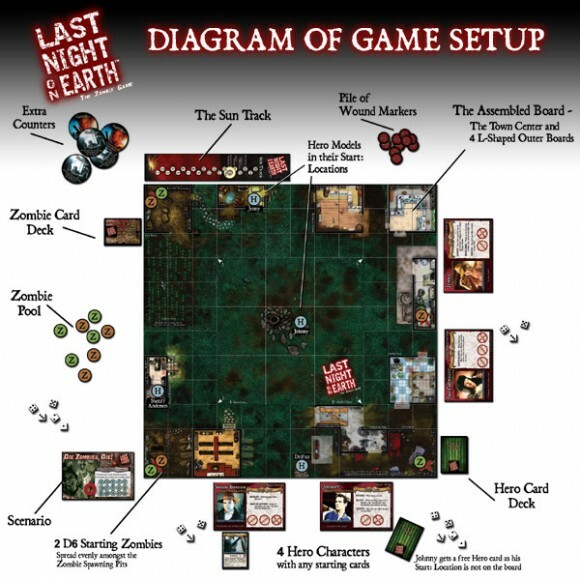 Last Night on Earth, The Zombie Game is a board game published by Flying Frog Productions based on the zombie survival genre that can accommodate 2-6 players. It is a combination of cooperative and competitive; as several hero players work together to defeat the scenario while one or two players act as the zombies and try to defeat the heroes. The components for this game are just beautiful. Flying Frog Productions did not skimp on components at all. With thick cardboard tokens, great plastic sculptures, and quality cards used for the zombie and hero decks. There have been a few people that have had a bad batch of cards, but it sounds like Flying Frog Productions has been ready to replace them with ease. The game comes with a full color rulebook, 1 town center board game (flip side is the manor house for one particular scenario), 6 L-shaped outer board pieces, 8 hero figures, 14 zombie figures (7 green and 7 brown), 60 card zombie deck, 60 card hero deck, 6 reference cards, 8 hero character sheets, 5 scenario cards, plenty of counters, 16 six-sided dice, and 1 CD of original music to use as a soundtrack. The only thing I would replace if I could (and plan to in the future) is the little dice that come with the game. With all the other components looking so great, the small dice area bit of a letdown when you first pull them out. But it is a minor thing and does not really take away from the overall game. Cooperative Play – Up to 4 players work together as the heroes to complete a chosen scenario and survive the zombie onslaught. At the same time, up to 2 players can work together as the zombies to try and thwart the heroes. The exact number will depend on each side will depend in the number of players participating in the game. Competitive Play – There is also a competitive play mechanic with this game, as the zombie players and the hero players work towards different goals and are in direct opposition of one another. When the game ends, either the zombie players or the hero players will be victorious. Hand Management – Both the zombie players and the hero players have card decks that they can utilize. For the zombie player it is automatic but the heroes have to search in order to collect cards. Hero players might have to decide on items to discard or trade away if they already have 4 items in play (or 2 of those items are already weapons). Zombie players have a max hand size of 4 (total, so if there are two zombie players, each has a hand size of 2). Zombie players can also discard up to one card per turn. So zombie players need to play or discard their current cards in order to get more cards. Dice Rolling – Yes, the random element of dice rolling is involved in this game. This is a mechanic that can be a killer for some people. But honestly, it works for the type of game this is and between special abilities and cards there are plenty of ways to possibly manipulate the dice rolls. The dice are used for hero movement, ranged weapon results, ammunition checks, and normal combat. Modular Board – There are 6 L-shaped pieces that make up the outer board, but typically only 4 of those pieces are used at a time. So the makeup of the town is slightly different with each game. No Player Elimination – Zombies are going to kill heroes, that is part of the game and eventually those evil random dice turn on you. The good news is that Flying Frog Productions has thought of this and added in a mechanic so that players are not eliminated from the game early. If a player loses the last hero they control, they simply randomly grab a non-played hero and start in a random location. The game keeps going and everyone continues to play until one side or the other meets their objectives. What if you run out of non-played heroes? Not really possible, because one of the default objectives of the zombie players is an automatic win on killing 4 heroes. Scalability – This is one of the things I really like about this game. There is always the same number of heroes on the board, regardless of number of players. There is also always the same number of zombies to control. In this way the game scales easily from 2 to 6 players, even in mid-game if necessary! If you have a game night where people come and go, this game works extremely well for adding and losing people during play. Nothing on the board changes, just which player controls what. There are 5 scenarios that come with the game, and several scenarios available for download on the Flying Frog Productions website. Not to mention the expansions that have come out since the core game. These scenarios, combined with the modular board, keep the game from being the same with each play. Future expansions will also have new scenarios in them, making this a fun and flexible game with a good amount of replayability. Scenarios range from the basic, kill 15 zombies before 2 heroes die, to the more advanced, take out 3 zombie spawning points, find and rescue 4 townsfolk, or keep 9 zombies out of the manor house until daybreak. Each scenario will require the hero players to try and work together for a different goal and possibly use different powers available to them. I am a huge horror movie fan, and that includes zombie movies. I have a lot of the zombie related board games themed around the genre; and this is by far my favorite zombie related board game. I have played this game countless times and even demonstrated it at conventions and gaming events, and I have yet to grow tired of it. I love breaking out this game with a new group, or with a bunch of people I know enjoy the genre. So if you ever want to give it a try, just get a hold of me; I am always up for a game! I highly recommend giving Last Night on Earth, The Zombie Game a try, especially if you like zombie genre games. You will not be disappointed. My friend got this for his birthday and we spent a decent amount of time playing the various scenarios. Teams are divided between survivors and zombies where there can be up to 2 zombies and 4 survivors. The various scenarios give you different starting places and objectives from the very basic tasks of killing zombies or defending the manor to the more complex tasks such as collecting items. The length of the games will depend on the scenario and how familiar you are with the game. Starting out expect to spend about 2 hours just learning the rules, setting up the board and playing the first game. After that games seem to take 30-60 minutes, again depending on the scenario. The game is fairly open so expect to be checking the rule book at first fairly often for LoS rules and various mechanics. The cards add a good amount of randomness and very few seem to be over powered. Zombie cards seem to be a bit weaker but this is probably by design as in most scenarios there are significantly more zombie lives. The survivors seem to be much more strategy based than the zombies. They can use things such as the “hunger” mechanic to pull zombies around and must balance fighting the horde with collecting items to fight them with and finishing the scenario. Zombies are pretty much just driven to kill, which is fun but much less involved strategy wise. Pros: Good mix of co-op and vs. Solid construction. Scenery is fun if you like zombie stuff. Good number of scenarios. Cons: Cards can seem weak or you draw too much stuff that is non-pertinent to the scenario and a waste. Learning curve is rather steep and there are a lot of rules. Last Night on Earth is a classic zombie movie played out on a game board. LNoE is a scenario team game, in which players divide among the human and zombie teams, each with an objective to complete to attain victory. Players can randomly or intentionally choose from different human characters, which the zombie players will always have the same generic zombies. Scenarios usually involve collecting certain items from the players’ card deck then meeting at an objective spot on the map. Each team gets a deck of cards that modify their fights, give bonus dice to roll, or frustrate enemy actions. The game has a built in timer marking the sun sinking toward nightfall. If the heroes haven’t won by the time the sun sets, the zombies overwhelms them and the zombie player(s) win the game. The humans have access to a deck of weapons, actions and allies that help them kill and escape zombie attacks. They will move across the map with a d6, or sacrifice their movement to search a building if they happen to be in one. Searching is the card draw mechanic for human players. After that, they have the option to trade equipment, shoot firearms, and engage in melee combat. Zombie players draw cards at the beginning of each turn and roll dice to randomly decide if more zombies will appear in a given turn. The more zombies you already control, the lower your chance of placing new zombie figures. Zombies move across the map once space at a time in an attempt to mob the heroes and kill them. Many zombie cards add to movement or combat dice. Firearms and melee are how damage is done. A firearm weapon card possessed by a human character will list its range and the d6 roll needed to successfully kill a zombie. In melee, there is an opposed roll in which humans roll 2d6 (choosing the highest result) and zombie roll 1d6. Zombie win ties, but human success does not inflict wounds on zombies, it merely prevents their suffering a wound. For a human player with kill a zombie in melee, they must roll higher than the zombie player AND roll doubles. Turn order is clearly spelled out on the reference cards for each player. That being said, since players are on different teams, there can be times when player order becomes confusing. Also, the timing of some cards is confusing and the FAQ in the rulebook isn’t always the most helpful. Reading online FAQs and forum posts on rules clarifications is very helpful. More clarity in the rulebook would have been helpful. That being said the rules are fairly well balanced for each team in each scenario. The components are all excellent. The plastic figures are great sculpts and easy to distinguish from one another. Character cards, scenario cards and map tiles are all high quality, thick stock, with easy to read printing. The art is stylized photography. Most of the content’s style is identical to Flying Frog’s other titles like A Touch of Evil and Invaders from Outerspace. Each scenario can be played through multiple times on different teams before they get stale, giving the game respectable replay value. Most players will find the game entertaining, but zombie fans especially will return to Last Night on Earth again and again. This has got to be one of the better zombie games. Everytime I visit a friend in Nebraska he asks for this game to be brought. Being able to play as either the zombies or the survivors makes this game. The board that screws in to smaller squares vs the center big squares makes it so that the zombie player can actually get somewhere. Personally I love the art but not a great game for younger kids because of the art which is kinda graphic. The board is changed each game and that keeps it fresh. I love the expansions, they add quite a bit and I don’t think they overpower or diminish either side and I own all the expansions. This game was re-released as a 10th year anniversary set, I’ve had mine since the original realeaseand this is a game that will be in my collection until I join them as a zombie! We initially bought this game based on our love for zombies and wanting to get into some different types of games. It definitely has some areas that need tweeking, but this is addressed in the expansions. My only real gripe is that even after playing this game dozens of times over the last couple years we still frequently have to resort to the rule book. There are so many different situations that remembering all the rules can be a challenge. With that being said, my 6 year old son is able to grasp the basic rules and play along with us, with some mentoring of course. The components are high grade.Cards are sufficient thickness and size for normal usage,and the cardboard stock counters as well.Dice included the same.Board components in my game showed no problems at this time. Box itself same.Plastic figures sculpted very nice ,just begging for an artist to paint them. Gameplay itself runs smooth once everyone is familiar with rules.Teaching the rules is easy during the co-operative play of the game.The rule book for a first timer is not bad.Some disagreement on a few cards text arose but were discussed and resolved.Cant say much more than I hope you have the right people playing with you. – Emulates the theme perfectly. Scenarios like “Get to the Truck”(?) really make you feel like you’re caught in a classic zombie flick. – Some of the rules are vague and fiddly. It takes some serious effort to track all of the effects in play, and you’ll have to make snap judgement calls on the interactions between cards and abilities if you don’t want to spend your entire night flipping around the rulebook or looking up answers on BGG. Games, for me, are all about creating an experience and letting the players tell a story. This game facilitates that beautifully. Out of the box, the vague/fiddly rules make learning the game a huge obstacle. But if you put the effort into it, you can turn this in to a fantastic gaming experience. Last Night on Earth is really a great tabletop game. The board graphics are nice, and the changing board is a good touch to keep the game interesting and different each time you play – a huge plus for avid gamers. The game is complicated enough to keep your interest and not so complicated to be difficult to learn. The choice of starting heroes and the ability for players to play as heroes or zombies make the game more adversarial and compelling than many board games. The photographs of actual people instead of just drawings for characters give the game a more realistic aspect than many fantasy games. It’s easy to see that a great deal of thought went into the design of the game. The game play options included in the rules and the encouragement to develop house rules for the game as well are also a huge plus for avid gamers. I recommend Last Night on Earth for gamers interested in fantasy and horror games. It’s the end of the world in this small town. The town is overrun with Zombies! One or more players control the zombies and the environmental effects. The other players are each one of the townsfolk. The game comes with a number of scenarios that are pretty flavorful. Usually they require getting certain equipment cards and then taking them to a location on the board. Some are straight up kill the zombies. Each of the characters can take up to 3 wounds before they die. When a player loses a character, they simply choose one that was previously not chosen and keep playing as that character. The big problem here is that if your characters dies at any time but the very beginning (which is just depressing), you will potentially be doomed with almost no gear. Role-playing as the characters can be fun and the abilities each character gets are appropriate. Perhaps the biggest problem with this game is the reliance on randomly drawing cards that your character is specifically good with (chances are about 1:100). This aspect is just frustrating most of the time. This game has some limited replay value, but it is not the kind of game that you will want to play again immediately after finishing it. And that is why I don’t think it is a great game, or maybe even a good game. Afterwards, most of the players are just ****** off. As in a previous review, I have to agree that all the components are too shiny. For a zombie game, especially one that is B-movie style, I feel like the cards should come pre-frayed and the board should be peeling at the edges when you buy it. The game does come with a silly soundtrack CD that is appropriate with cheesy horror music. This is one of those games that makes you frustrated by how easy the rules seem, but the rules are actually pretty clunky. The mechanics of the game are not all that interesting. Figuring out when the zombies attack, when players counterattack, and the order of events in a phase are fairly vague. 2-6 players A 2 player game of Las Night on Earth just seems silly. The best part of the game is the character interaction, not just the zombie vs. player aspect. 12+ age There are some cards that will present slightly, shall we say, “mature” moments. A 12 year old would probably not fit in at those moments. 60 minutes The game length listed is about right unless the humans get owned real fast or get ****** off and quit before then. My opinion may be slightly skewed on this game. When the game was taught to me, it was by someone who didn’t really read the rules all that thoroughly (not that the rules are all that complicated). I have been presented with the situation of play this game or play no game and I find that I choose the play no game option about 60% of the time. I will do my darnedest to change the game to something else. If you do like zombie stuff a lot, and you like B-movie horror, this game could be for you though. Especially if you get someone that actually knows the rules to teach you the game. This game doesn’t have too much strategy in it, but it makes up for it with a rich theme. It’s one of those games where you very much get out what you put into it. 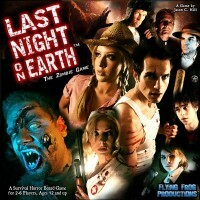 Add a Review for "Last Night on Earth, The Zombie Game"